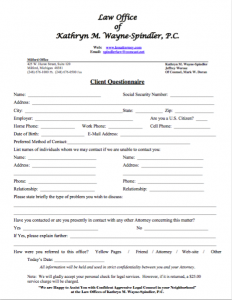 Kathryn Wayne-Spindler & Associates’ new clients can complete the Client Questionnaire and return it to our office. The information you provide on the Client Questionnaire will allow us to learn more about your legal situation so we will be better prepared to answer your questions when we meet in person. Please Click on the “Client Questionnaire” link below and check your computer’s “Downloads” file.